Every decade has its golden toy line: Kenner set the bar in the late '70s with its Star Wars line, by showing how a big line could be done; GIJoe invaded the '80s with its huge variety of characters, vehicles and playsets; comicbook superheroes ruled the '90s, epitomized by the remarkably huge X-Men line. 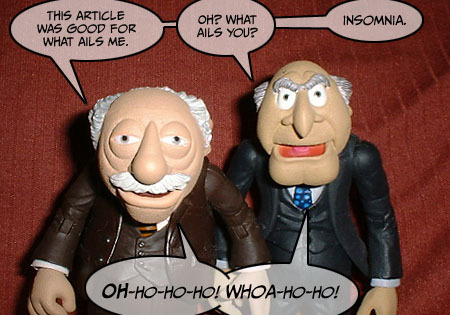 Halfway through the first decade of the new millennium, we've already seen the rise and fall of the first great toy line, post-2000: Palisades' Muppets. Before the Muppets line, Palisades had done a few small toy lines (its Resident Evil figures are still the best ever made), but it was relatively unknown, just another generic toy company in a market that was - at the time - full of such things. Then, in the latter half of 2002, it shipped its first series of Muppet Show figures, and suddenly everybody knew its name. The initial series had four figures, four variants and a playset, setting the tone for the line. Each of the figures came with a nice selection of accessories, including a display base touting the Muppet Show's 25th anniversary. The exclusives were spread out among various shows and retailers: Kermit was available at Toys R Us and through ToyFare magazine, Piggy lived at Electronics Boutique, et cetera. However, it was with Series 2 that the line really started to show its promise. Palisades was really dedicated to its Muppet license, and it displayed that fact well with the Series 2 figures. We got our "plain" version of a major character (Fozzie), a continuation of an existing sub-set (Floyd, Animal and the Electric Mayhem), a truly obscure character (Crazy Harry) and a variation of a main character (Gonzo the Great). It was this last one that caused the most distress among fans. Why were we getting Gonzo in his daredevil costume before we got him in his usual outfit, a tiny suit? The same thing came up in Series 3, when we got Rowlf in a tuxedo rather than "naked," and in Series 4 with Sam Arrow. What was Palisades thinking? As we've said before, with any large property or long-running line, eventually you hit a wall. You reach a point where all the popular characters have been made, and most of the obscure ones, too. Any company that wants to tackle a big license will eventually have to deal with this inherent limitation, and there used to be two main ways to do it. The most popular tactic is the one employed by Mattel and Hasbro: try to put out some version of your main character in every series. Come up with new costumes and new excuses to create another Batman, another Darth Vader. ToyBiz is trying something similar - with Marvel Legends - but at least they keep switching their rehashes between multiple characters. Another plan, lesser used, is the one seen in Playmates' World of Springfield line. It released the plain versions of the entire Simpson family in wave one and tried to do variations of Bart and Homer in every series after that. When that failed, it wasted no time in diving straight for the bottom of the barrel, with such must-have characters as Plow King Barney and Freddy Quimby. Instead, Palisades chose to change things up. Playing it smart, it got into the variation game early; if the plain Sam is in Series 4, then only the die-hard completists will want Sam Arrow in Series 8. Switch that order, though, and the line will stay fresh longer - suddenly Series 8 has an iconic version instead of a crappy variation. Palisades was smart, too, with its convention exclusives. At the outset, they were mostly new versions of the characters who'd come with the playsets: Vanishing Cream Beaker, Tour Animal, Culinary Catastrophe Swedish Chef... it gave fans the opportunity to get characters that had previously only been available to those willing to shell out big bucks. Not that con exclusives aren't expensive, but they take up a lot less shelf space. And to ensure those who were unable to travel to every show weren't excluded, Palisades made every show special available to members of its collector's club. Despite that, the Muppet line is a completist's nightmare. In addition to all the store and convention exclusives, many of the figures had chase repaints inserted in every case (see, for instance, Series 2's Floyd, with red and blue jackets, or Series 7's Johnny, who wore three different suits and played three different records). Then, on top of that, there were industry giveaways, party favors and some sets you're likely never to see, such as the set of Kermit and Piggy as a bride and groom, given as gifts at a Palisades employee's wedding. I'm sure someone out there owns a truly complete set of Muppets figures, but most people who try will end up with nothing but a headache. The line wasn't without its flaws. Due to Palisades' small size as a company and the expense of the license, the figures always cost two or three dollars more than they should have. Palisades did its best to make the figures worth the price by including the coolest accessories imaginable, but most series still ended up on clearance before they started moving. The original packaging for the line mimicked the Muppet Show's red curtain, which suited the line well. However, when the scope expanded beyond just the show and into the movies, Palisades decided to change things around. It was a bold move, to change the trade dress for an established brand, but the new blue design looked great. The only problem was that along with the change in color, Palisades switched from fan-friendly blister packs to the hated clamshells. For a company whose motto is "Play With It," this was a pretty bad move: you should not need a tool to open your toys. As the line progressed, retailer support dwindled, which is why the last few Muppet figures turned into online exclusives - there just wasn't anyone else willing to do the job. You have to give credit to Palisades, though: it kept fighting, and kept the line alive through the very end of its license. Its success with the Muppets has earned it a place of prominence in the industry and made it the go-to guys for properties that demand a certain kind of love and attention. Could anyone else have done such a good job with Zim, the Pink Panther or Ren & Stimpy? Palisades' love affair with Jim Henson's creations will continue with next year's Sesame Street line. I can't help but think, though, it's a shame that Palisades had to quit now - Season 1 of The Muppet Show has just been released on DVD, and an American Idol-style show next year is intended to test the waters for the Muppets' return to television in a regular series. It's annoying that Palisades is going to miss out on the wave of interest all this is sure to bring. If it had been set up in honor of the show's 25th anniversary instead of its 30th, who knows where the line would be today? If another company picks up the Muppets license after Palisades, it's going to have some incredibly high expectations to meet. Anything less than what Palisades delivered, and the fans are going to be rabid. For a small company no one had ever heard of, it really did things right, and showed the industry's old guard how a good, long-running toy line should be done. It's time to cut the music. It's time to dim the lights. It's time to say goodbye now, to The Muppet Show tonight.